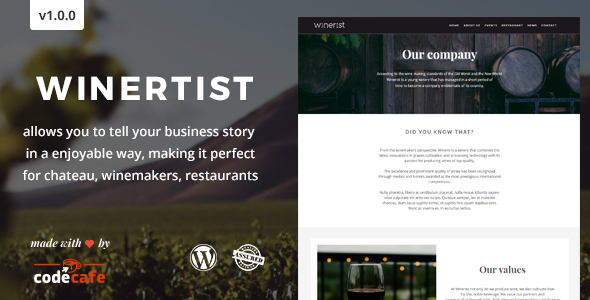 Winerist is a beautiful WordPress theme that allows you to tell your business story in a enjoyable way, making it perfect for chateau, winemakers, restaurants. It’s not another premium WordPress theme, it’s something more focused on your business needs. We already have done some research on the market and created a great product for your customers. With Winerist, the latest features of WordPress are used. Wineristis ready to be translated into whatever language you choose. Also is fully compatible with the WPML plugin. With Winerist you can create fast and easy any email marketing campaigns, thanks to MailChimp powerful service.